The New York Racing Association, Inc. (NYRA) today announced it has canceled live racing scheduled for Monday, January 21, at Aqueduct Racetrack due to dangerously low windchill values forecast in the New York City metropolitan area for Martin Luther King, Jr. Day. With the National Weather Service calling for extremely frigid temperatures with the potential for sub-zero wind chills, NYRA officials made the decision to cancel Monday's card in advance for the benefit of horsemen and racing fans. All races slated to be offered on Monday will be brought back as extras on Thursday, Friday and Saturday's offerings at Aqueduct. The 98th running of the $100,000 Interborough, a seven-furlong sprint for fillies and mares 4-years-old and upwards set to be the feature on Monday's card, will instead be run on Friday, January 25. “We made this decision in the best interests of the safety of all participants, and to provide horsemen with ample opportunity to plan the best course of action for their athletes and staff,” said Martin Panza, NYRA's Senior Vice President of Racing Operations. In addition to live racing, training at both Belmont Park and Aqueduct, including jogging barns, will also be closed on Monday. NYRA officials will continue to monitor the inclement weather expected in the New York City metropolitan area over the weekend and provide updates on any potential cancellations at the appropriate time should conditions warrant. 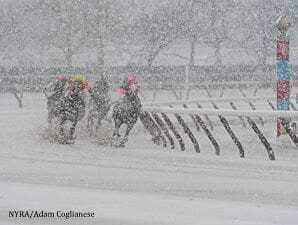 Aqueduct Racetrack will remain open for simulcasting and online wagering is available through NYRA Bets. Belmont Café will be closed for simulcasting on Monday. During this time of cold, winter weather, NYRA will have extra support staff on hand at both Aqueduct and Belmont to assist with any facility-related issues. Horsemen are instructed to contact NYRA Security (516-775-3096) with any issues during off hours. Live racing continues tomorrow, Friday, January 18, at Aqueduct with an 8-race card with a first-race post time of 12:50 p.m. Stakes action returns to the Big A on Saturday with the 126th running of the Grade 3 Toboggan as the highlight of a 9-race card, while Sunday's 8-race card is buoyed by the 148th renewal of the Ladies Handicap. This entry was posted in Horseplayers and tagged extreme cold, new york horse racing, nyra, weather cancellations by NYRA Press Office. Bookmark the permalink.